This is the last blog for our 2016 trip to France. 2017 plans are up in the air. Hopefully there will be more to come! Monday October 10, 2016 is Columbus Day in the USA. Many businesses had the day off from work. Malls and stores use it as a day to begin holiday shopping. Today in France the temperature was 6 C or 41 F when Sandy walked to La Fournee Malouine to buy our breakfast. This boulangerie is listed on the Saint-Malo tourism site as being one of the locations referred to in Anthony Doerr’s book All the Light You Can Not See. It is one of our favorite boulangeries. We mailed a card at the post office, stopped at the syndic to pick up our keys to the cave that he borrowed, and looked at one of our “potential gifts” from yesterday. Unfortunately the box containing the gift says “made in China” so we decided not to buy it. Tuesday October 11, 2016 is 5 C! Cold!! We spent one hour today with Christine for our final tutoring session with her. She has helped us a lot! We saw the kumquat bush her neighbor has on our way to and from Christine’s house. It was shaped and trimmed as a hedge but full of both kumquats and flowers. It was lovely to look at. We know that people can keep geraniums here outside all year without harm, but didn’t realize it stayed warm enough for kumquats. On our way back we stopped at the Carrefour Market in Courtoisville to shop for a few items and while waiting for the bus sat next to an older gentleman. He was reading the Ouest du France newspaper from today and read the same article to Phil three times. When another lady joined us on the bench he read the same article to her three times too. Phil had a short conversation with him about the weather, the bus etc. He seemed to understand and responded correctly. It’s always interesting when taking public transportation. On our bus ride back, we spotted two of the Corsair ferries in the basin. One of them, the open boat, was completely covered with what looked like a white plastic tarp. It’s in the harbor for the winter. Sandy needed to go to the doctor today. She was able to make the appointment herself but the doctor available was neither of the two doctors she had seen earlier in the year. The doctor was okay, not as personable as the previous two she had seen and did not speak English, but figured out what was needed and we were off to the pharmacy. The cost of the visit was 35 euros and the two prescriptions were 8 euros. Hopefully, problem solved. Wednesday October 12, 2016. Sandy had a much better night and of course, so did Phil. Phil shopped for our breakfast today and the temperature was 7 C. Definitely cool, but not much wind. Phil returned Sandy’s library books to the Mediatheque and almost froze. The wind had definitely picked up. Later in the afternoon we took the recycling to the center and found a gift we wanted to purchase. It was sunny but cool so we soon headed for home. Thursday October 13, 2016 was the day for our last hair cut in Saint-Malo. The coiffeurese hasn’t completed the sale on her building and didn’t sound too happy about the situation. We took the bus to the IUT stop across from E.LeClerc. Phil took care of changing our mailing address at the utility company and tax office. Sandy dropped off batteries and light bulbs for recycling then purchased 6 items we needed. We were back home using only the one bus ticket in the hour and a half allowed time frame for each ticket. Friday October 14, 2016 was cloudy. Sandy shopped for our breakfast and purchased a croissant amande for the first time in quite a while. They are delicious! Full of almonds, a thin layer of thick custard, made with croissant dough and covered in powdered sugar. We think they have at least 1000 calories per piece. However, they aren’t available in the USA. We took the navette bus to Saint-Servan. We wanted to wish the butcher and his assistant a good winter, thank them for delicious meat, good prices, and tell them goodbye. Sandy spoke in French to tell the assistant when we were leaving and when we hope to return. Phil bought a piece of filet mignon to cook for dinner with the last of our french fries. He wished the butcher a good winter and the butcher told him they await our return with pleasure. Lovely French expressions. We waited one minute for the navette to return to Intra-Muros. We were away from our apartment less than one hour. Our filet mignon at dinner time was probably the best and most tender piece of beef Sandy can remember. Tres, tres, bon!!! Saturday October 15, 2016 was again cloudy and cool. Sandy hurried to take her shower and walk to the boulangerie before they were ready for their break at 9:00. She was crossing the street at 8:52 am as both of the boulangers walked outside their door. They greeted her warmly as usual and the younger of the two went back inside to help her. They had just placed a tray full of chou a la creme in the patisserie case and she bought one flavored with framboise and another flavored with chocolate for our dessert. Later in the morning we shopped at Philippe Bouvier Chocolatier and took the rest of our leftover bread to the Place du Marché aux Legumes. We threw all of the bread into the grassy-flower area and watched sparrows, pigeons, and a gull enjoy the bread buffet. We intended to watch our friend Alain play boules for the last time in the afternoon. However, just as the game was to start it began to rain fairly hard. So, game cancelled and we stayed inside. By 17:00 the sun was out and the sky was blue. Too bad the rain cloud arrived at the same time as the scheduled game. Sunday October 16, 2016 was our last full day in Saint-Malo. Sandy had a short conversation with the boulanger at Simone boulangerie when she shopped for our breakfast. She told him we were returning to the USA. He asked where we were from in the states and he knew where Minnesota was located. He wondered if we were returning to vote. He also volunteered that he and others in France hope Hilary will win. It’s interesting to hear how other people in the world care about our country and what goes on there. We walked to the hotel Quic-en-Groigne and told our friend Marie-Dominque farewell and made the first of a couple stops to the recycling-garbage area. She told us to have a good trip and they hope to see us next spring. We hope so too. We ate in the middle of the afternoon at the Fish + Chips shop. Delicious and a huge quantity of both fish and fries. Very tasty and it was warm enough (19 C) to eat outside. After eating we spent the rest of the afternoon cleaning, packing, and organizing. Lots to take to the recycle area in the morning. Monday October 17, 2016. We woke up before daylight and walked to La Fournee Malouine to have breakfast. after Sandy put all of our sheets and towels in the washer. We told the propritriece that we were leaving this morning and thanked her for being patient with our French and for preparing such delicious baguettes and patisseries. We walked to the harbor to look at the high tide which had a co-efficient of 114. It was almost even with the street. The Brittany ferry moored in the harbor looked like a cork because it was floating so high. We returned to the apartment to unplug everything, cover all of the furniture and bedding in plastic. We turned the mattresses over so they would be ready for our next visit. Sandy took one more bag of recycling to the center and stopped in the Place aux Legumes to give the birds our last pieces of bread. Phil ran the vacuum for the last time and we rolled down all of the shutters. Our friend Jean-Louis picked us up a couple of minutes after 11am and drove us to the train station (Gare). It was a gorgeous day, sunny and a temperature of 18 C. We visited with him and his wife Claudine, posted our tickets, and found our seats on the train. We had reserved 1st class tickets with our seats facing each other on the aisle. There were two types of seating available, the type we had with only one seat width on the side and 4 seats facing each other with a table in the middle on the opposite side. The ride was fine, less than 3 and a half hours and we were in Paris at station Montparnasse. It was sunny here and 19C. Sandy did not bother to wear her coat in the taxi. We took a taxi to the hotel Plaza Opera on rue de Maubeuge and checked in. When we were here in March we had a very nice room. There were two twin beds next to each other as a queen sized bed. There was a desk, one arm chair closet area and a luggage rack. In the bathroom was a huge bathtub with shower. It was one of their premium rooms and was on the 3rd floor. This time we were in a larger room but it is L-shaped. There was a king sized bed, a desk, arm chair, two stools, nice sized closet area with shelves and a luggage rack There was a full sized shower stall in the bathroom. We had two french doors leading to a “Juliette” balcony. We could step outside to look around and see the Eiffel Tower. The room also had another single sized bed that could also be a pull out trundle bed. We had requested a simple room with the two twins which made a queen bed. No extra view, windows, or space. We’re not sure whether we were given a nicer room because of our return visit within 8 months, or because the owner is good friends with Marie-Dominique and Michel from Saint-Malo. It was a luxurious room and huge in comparison to Paris sized hotel rooms. After settling in our room we walked to Galeries Lafayette Haussmann. Just like when we were here in March security officers were checking bags and under men’s coats before allowing you into the store. Sandy loves looking at the gorgeous stained glass center of this store. We made a couple purchases at the Paris gift area and walked back towards the hotel to find a restaurant for dinner. Our hotel is literally surrounded by hundreds of restaurants. We had a delicious Italian dinner at Cafe Rizzo next door to our hotel. Sandy had read about it on Tripadvisior in March but it happened to be closed the night we intended to visit. Tuesday October 18, 2016 It was sunny and 15 C when we woke up. We enjoyed breakfast in the lower level room at the hotel. Sandy had pre-booked the breakfast at a special price. We enjoyed baguettes with butter and 5 different varieties of confiture, croissants, pain au chocolate, several types of bread to be toasted, hot chocolate, coffee, tea, warm milk, yogurt, fresh fruit, canned fruit, two types of cereal, soft boiled eggs, ham, cheese, and freshly squeezed orange juice. After breakfast we walked literally across the street to catch the #42 bus to the Charm du Mars which is at the Eiffel Tower. Such a beautiful day to be outdoors. The area around the Tower is fenced off. If you want to purchase tickets, have tickets, or want to access the restaurant you must go through security. We caught the #69 bus which is a scenic route according to Rick Steves’ book. 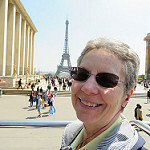 It is a long but lovely ride past the Lourve, Musee d’Orsay, Seine and boats, Bastille, Place de la Concorde, Hotel d’Ville. We got off, enjoyed a lovely lunch on a terrace. Sandy had a croquet monsieur with salad and fries. Phil ordered chicken with a creamy mushroom sauce and rice. We walked around a bit, got back on the bus and returned to the hotel. What a great day in Paris. It was raining by the time we were ready for dinner. A quick duck underneath the canopy and we were at Cafe Rizzo again. Phil enjoyed steak à point on top of a bed of salad and freshly shaved parmesan cheese. Sandy loved her homemade ravioli filled with mushrooms served with a light, thin, creamy mushroom sauce. For dessert Phil had a traditional Tiramisu and Sandy had Tiramisu with fruits. They included raspberries, currents, strawberries, blueberries, and black raspberries. They were delicious! Back to the hotel to finish packing, etc. Wednesday October 19, 2016 was sunny but cool. We had breakfast at the hotel and inquired about our car service to the airport. It was scheduled for a 9 am pickup. We checked out and waited in the lobby for the car. There was a lot of traffic that morning and the car was about 10 minutes late. The driver was from Libya and spent the entire 35 minute ride explaining to us about his country and the troubles his family had. He had a wife and son and was planning to move to the U.K. where he would work at the bank HSBC. It was a very informative ride to the airport. We checked in, checked our luggage and headed for TSA. Phil forgot to put his French Opinal pocket knife in our luggage before we checked them. He handed it to the agent who immediately disposed of it. That was disappointing for sure. Now we had 3 hours to wait. There’s always a lot going on so we were fine. However, the boarding time for our plane came and went and we were thinking of out tight connection in Detroit. Finally they began to board the plane. We were in the “Sky blue priority” so didn’t wait much at all. However, as we descended the ramp what was waiting for us was a bus, not a plane. After crowding as many standing passengers as possible in the bus we took off. Sandy doesn’t do well holding on to the railing and frequently looses her balance on buses when standing, so it wasn’t an easy ride. After riding around the airport for almost 10 minutes we arrived at the bus only to have it begin to rain. We made it up the stairs and onto the plane. Our premium economy seats were fine. Still really not enough leg room for Phil but so much better than economy. Sandy prefers the 4 rows of seats that are “curtained” off from the rest of the plane. It took a long time to get everyone on board and we departed 45 minutes late. We had little hope of making our connection. Arriving in Detroit, we were the first passengers off the plane. Sandy had talked to the head stewardess and she explained what we needed to try to make the connection. A lady seated in front of us had a similar situation. We first waited in line for passport control, not too bad, then had to wait for and pick up our luggage which had been marked “priority” for a tight connection. Air France is good about that. Delta made the decision (told to Sandy by one of the Delta employees) not to pay attention to the priority status and put our luggage with the general population instead of using a priority carousel. Finally got our luggage after an employee worked 4 times to get the carousel working, headed for Immigration control then to have our bags rechecked. Our next surprise, not planned or informed of, was we had to be completely rechecked at TSA. We hadn’t left the secure area of the airport having just arrived from Paris, where security is high, and we had to remove shoes, take liquids out of hand luggage, walk through a screener and Phil had to be patted down. Our Sky Blue status with Air France means we don’t remove shoes or liquids and are usually in a shorter line. Not so in the USA!!! It was now 10 minutes before our connection departed. We quickly scanned a flight board and saw it was still boarding. We literally raced, walked and ran to the gate only to see that it had already departed. We joined many other travelers at the Delta Help Desk. After speaking in person to an employee, she took us to one of the help phones, had us talk to a Delta representative since we’d come from an international flight, then printed the boarding passes for us. We were booked on an 8:30 pm flight. Phil called Hertz to tell them about our time change, we ate a McDonald’s fruit parfait, tried to calm down and relax then were able to board our flight. We were given premium economy seats again on the Delta flight but both seats were at the window in different rows of 3. It’s only an hour and a half flight from Detroit to Minneapolis, so no problem. When we arrived in Minneapolis we were at one end of the airport. The baggage claim was at the other end. During our running in Detroit, Phil hurt his right heel. Now it was so painful he had difficulty walking. We weren’t sure if our bags made it so while Phil stood at the carousel, Sandy talked to the “luggage help” employees. Believe it or not, one of our luggage made it onto the flight we missed. The other piece was on the later flight that we traveled on. So, with both pieces of luggage we walked back to the other end of the airport to the rental car desk. Our name was not on the “Gold member” hertz board so Phil spoke to one of the employees. Seems like Phil’s call to Hertz didn’t register with Minneapolis so they cancelled the reservation as “no show”. The employee arranged for a car, parked about 4 blocks away so another painful walk for Phil. We were in the car and out of the airport. However, neither of us remembered to ask for a map, the car didn’t have gps and it was now 10:20 at night. We’d been up and awake for 22 hours straight. The gps on Phil’s phone was ridiculously re-configuring and after a couple of wrong turns we were headed for Rochester, MN. We took 55 south to 52 south then in Rochester, took 90 west towards Winona. There was very little traffic but after exiting the highway on the Winona turn off Sandy spotted several deer next to the side of the road. Phil slowed down and we were both on the look out. We arrived at the Alexander Mansion B + B at 12:30 am on October 20, 2016. We’d been up and awake for 24.5 hours. Sandy looses her balance with lack of sleep and has trouble concentrating. Thursday October 20, 2016 we woke up in Winona. Sandy was able to sleep to 7 am (14:00 in France time) and Phil slept until 8 am. Phil’s heel is still very painful to walk on. Sandy feels discombobulated. There were quite a few changes to the apartment. Everything had been painted. A new tv, mirror, table, chairs, and sofa were in the living room. There are new gardens planted outside. It feels nice to return to a lovely apartment that feels like home. An autumn fog hiding the tops of the bluffs in Winona.